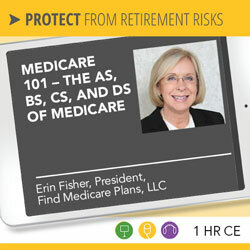 Erin Fisher, President and Founder of Find Medicare Plans, LLC. 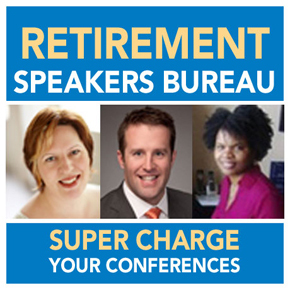 Editor’s note: This article is an adaptation of the live webinar delivered by Erin Fisher, President and Founder of Find Medicare Plans, LLC. in 2018. Her comments have been edited for clarity and length. 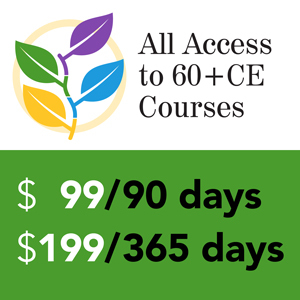 You may also choose to take the full length course Medicare 101 – The As, Bs, Cs, and Ds of Medicare – Erin Fisher for 1.0 hour continuing education (CE) credit. Please note: all references to premium, deductible, copay, etc. dollar amounts reflect 2018 numbers. There are four parts to Medicare: A, B, C, and D.
Part A covers a person when they’re an in-patient in a hospital and if they’re an in-patient in a skilled nursing facility. Part B of Medicare covers a person when they are not in a hospital and not in a skilled nursing facility. It not only covers doctor visits, which may or may not be costly, but it includes the emergency room visits, out-patient surgery, all the testing that goes on including MRIs, CAT scans, etc. An ambulance, durable medical equipment, home healthcare, just everything you can think of is covered if you’re walking outside your home and going for medical treatment. Part C of Medicare is called Medicare Advantage Plans. These were created by the federal government in the early 90s to reduce fraud in Medicare. The government pays the premium to the carrier, and the carrier delivers all of the Medicare benefits to the individual that enrolls in their plan. The plan also, by virtue of its name, Advantage, needs to give additional benefits to an enrollee that Medicare does not cover. The Medicare Part C plans are part of Medicare’s open enrollment. The Medicare Part D plan, which is the prescription drug plan, is in and of itself its own federal law. It has many regulations to it just like the rest of the parts of Medicare which is one of the reasons that make this federal law so confusing. You could almost think of it as IRS. Because there are so many regulations for people here, many people do make mistakes in enrolling in all of these parts of Medicare. With Part A, there is no premium that we pay the government because we’ve been paying for it in our paychecks all our lives. If a person has no other insurance, they pay 20 percent of their bill if they’re an inpatient in the hospital. Medicare is going to pay 80 percent, but the person would pay 20 percent without any other insurance. Medicare also has a hospital deductible of $1,340 per benefit period. A benefit period is when a person is in the hospital for a certain diagnosis, they come out, and if they’re readmitted within 60 days, they’re in the same benefit period. If they’re admitted again after 60 days, they would have another deductible for that same diagnosis and they would have the $1,340 deductible applied if they’re readmitted within 60 days for a different diagnosis. If a person is in the hospital for longer than 60 days, they have a $335 co-payment per day up to 90 days. After 90 days, a person has a lifetime of 60 reserve days. Once you use them, you lose them. In order not to have a person pay all of these costs, they buy other insurance. On the right side of the page, the skilled in-patient nursing under part A – again, they’re spending the night here – there is no co-pay for the first 20 days of a benefit period. Still, it’s the same idea; they have 100 days here. If you’re there for 21 to 100 days, the cost would be at $167.50 a day, and again this is the same idea as being in the hospital as per the benefit period. You pay the cost for each day after day 100 if you stay in the skilled nursing facility. The idea of a skilled nursing facility under Medicare regulations is that a person has to show that they’re getting better through the therapy they’re receiving. If they are not showing signs of getting better, then the skilled facility knows that Medicare is not going to pay them. They tell the person they either have to pay for themselves, or they would have to leave the facility. Under Part B, this year there’s an annual deductible of $183. Again, this goes up a little bit every year, maybe $3, $4, or $5, and a person would pay 20 percent of their claim if they had no other insurance and Medicare pays 80 percent of the claim. Doctor visits mean you’re not in the hospital and you’re not in a skilled nursing facility. We know these can be very expensive, or they can be minimal. I have seen them for $5,000. Out-patient surgeries obviously could be costly. Home healthcare certainly is. Medicare does have some preventative screenings that were put into place a couple of years ago. Before that, they had none. It’s not considered a full annual physical. They call it a wellness visit, and there are a lot of preventative screenings within it, but some people are surprised that it’s not covered. For instance, an EKG isn’t covered under a wellness visit. If the person needs one, they would have to make another appointment and come back to the doctor for that. The durable medical equipment, which is DME, is covered under here. It could be expensive. 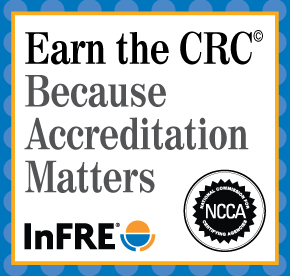 All testing is covered under here, chemotherapy, the ambulance, and many other benefits. 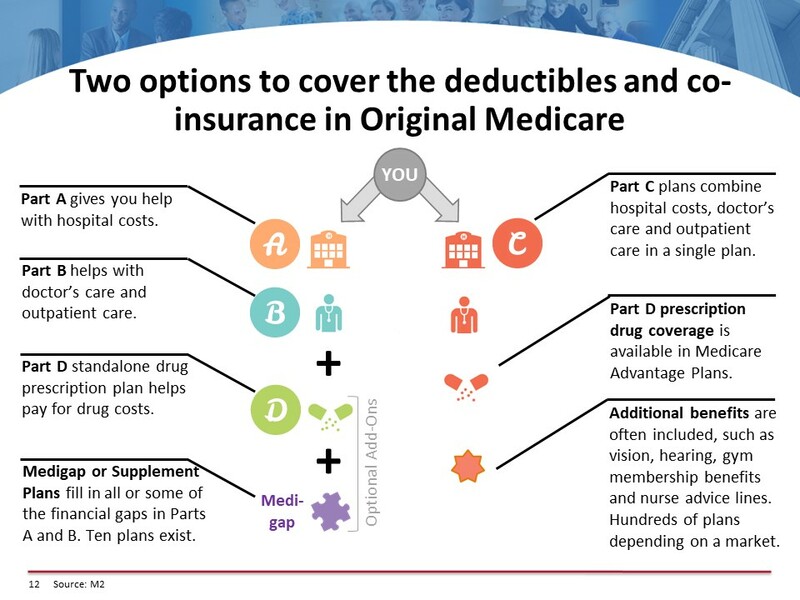 Part C of Medicare includes Parts A, B, and possibly D. You can have plans that don’t cover D because many companies might have their only retiree benefit be a prescription plan, which is really good. Medicare Advantage Plans may or may not have prescription coverage included. Medicare Advantage Plans can be an HMO. They can be a PPO, a POS plan, or a PFFS, or a Private Fee for Service, plan. We all know what an HMO is. A PPO is a preferred provider organization. POS is a point-of-service plan where you pay a percentage for your out-of-network part, and the company pays the higher amount. You might spend 20 percent. “Private Fee for Service” plans are not widely available because there is so much trouble with them. The federal government asks plans not to offer them. Only in very rural areas would there be a possibility of having these plans. All of these Medicare Advantage Plans have different co-pays, different providers, and different drugs on their list, and it’s a very detailed explanation. When a person gets the information from a Medicare Advantage Plan, it has to meet federal government regulations so that everything is very clear-cut. How can you get one? You can either buy them through people who are certified to sell the Medicare Advantage Plans, or you can get them directly from the carriers. The idea of getting them through an agent is that hopefully, that agent represents more than one Medicare Advantage Plan so a person can have options. Just because a Medicare Advantage Plan may be $0 in premium, there can be different costs within the plan. The co-pays and the co-insurance can be different, and it could make a big difference to a person signing up on one of these plans. Many of these plans start at a $0 premium; some of them go up to about $100 a month. Medicare Advantage Plans do include all of original Medicare, which would be the A and B of Medicare, and they do have to offer some additional benefits. They can provide some vision coverage because having your eyes examined for reading or distance glasses is not a Medicare benefit. Dental expenses are not covered under Medicare, so some of them might give you money towards dental care. You might have to pay a premium to get a dental plan. Some of them offer money towards hearing aids; some don’t. Many of them offer gym memberships and discounts on other over-the-counter items. The details of the Medicare Advantage Plans again are very well-documented when a person sees all of the co-payments under these plans, which they have to be given by an agent or if they go through a health plan, they have to be given to them in writing. Here’s how the prescription drug coverage works. Today there are 700 plans in the country. Most states have between 20 and 30 plans, and obviously all plans aren’t created equal or there wouldn’t be that many. The difference is not only in the premium, which is the least of a person’s worries here, but it’s in whether the drug is on their formulary and what tier that drug would be on. A drug can be on different tiers with different carriers, so the cost analysis of doing this is very important for a person. All these plans have mail order. A person may or may not save money with the mail order. It also can be determined when the cost analysis is done. There are four stages to this prescription plan. Some of the plans may have a deductible. They’re set in stone every year how high they can go, but many plans do not have a deductible. Many plans only have the deductible for the brand-name drugs. This year the deductible is $405. It can’t go higher than that. It can be lower, however. The initial coverage level: This is a level where a person pays a co-pay, and the carrier pays the rest of the price of the drug. When the co-pay plus what the carrier pays equals $3,750, they are in the “coverage gap.” In the initial coverage level, a person could conceivably be paying a couple hundred dollars, but the carrier is paying a couple thousand. They’re getting a monthly report – and they could also call the carrier – on where they are in these stages. If they have a cost analysis, they’ll know before even signing up for a plan if they’re going to go into any of these stages during the year. Let’s say the person did get to $3,750 – then they would be in the coverage gap. This year, they have to pay 44 percent of the cost of generic drugs and 35 percent of the cost for brand-name drugs until they have spent another $1,250. If they reach the $1,250 level, they would be in circle four or the catastrophic coverage level where a person is either going to pay $3.35 for a generic prescription or 5 percent depending upon the cost of the generic because some of them are expensive. They pay $8.35 for brand-name drugs or 5 percent. This whole process of four Part D stages starts anew every January 1. If a person signs up mid-year, then the costs are prorated, so they’re geared towards the month that they enroll. 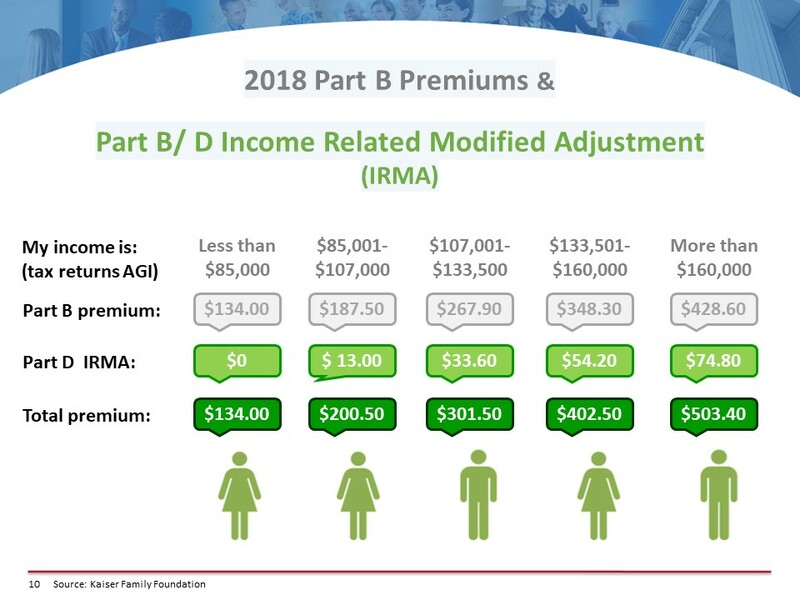 As I mentioned before, there’s no premium when a person goes on Part A because we’ve been paying for it in our paychecks, but there is a premium for Part B. The income levels here represent modified adjusted gross income (MAGI = your total adjusted gross income and tax-exempt interest income). You double the premiums if people file jointly. In the first column, if a person makes $85,000 or less, they pay the government $134 a month for Part B coverage. If they’re getting a Social Security check, it’s automatically deducted. If not, no problem; the government will be glad to send them a bill on a quarterly basis. The Part B premium increases for higher incomes, but also under Part D, there’s something called IRMA (income-related monthly adjustment). When a person makes over $85,000 they are charged this adjustment to help pay for the Part D program throughout the country. They do not get a plan for this amount of money. It just helps pay for the program throughout the country. For incomes of $85,000 to $107,000, the total premium is $250. These amounts went up drastically starting last January 1st. Every year they can go up, but they don’t necessarily go up. They are announced every year at the end of November. If a person’s income is $107,000 when working but is expected to go down to $85,000 when they retire, they can tell Social Security when they enroll that they’re going to retire, and their income is going to be much less. They would be able to get the lower premium if they went into a lower bracket. If a person inherits money, they’re going to go into a higher bracket for the year. There’s not a way to get into a lower bracket because they had a one-time windfall, but if a person does go into a lower bracket, they would need to call Social Security to fill out a re-determination form. Here are some coverage options. On the left side, for a person that’s on A and B and D of Medicare, they could enroll in a supplement plan. 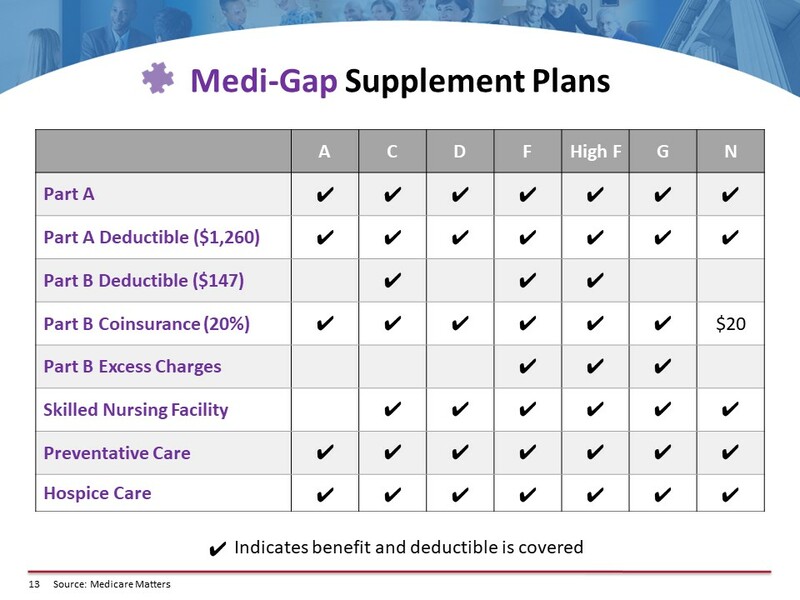 A supplement plan is going to cover the A and B of Medicare, and their Part D plan would be separate. There are ten supplemental plans, but, in most states, it narrows down to about three plans that are financially worthwhile. So, there is math to be done here. The state of Texas has 47 supplement companies. Most states average around 20. Every supplement plan does exactly the same thing; the government is in control of each of those plans. The idea is to get the plan that has the lowest premium with the company that has the highest A.M. Best rating, which is not hard to figure out. If a person wants to pay more and they’re on any supplement plan, they’re not going to get any more coverage. The supplement plan can cover all of those costs that we went over for Part A and B, or they could cover some of them with one or two co-pays. There are several plans that a person might want to consider. They would have to purchase a separate Part D plan, and they can do that through the carriers. Generally speaking, they should give whomever they’re talking to at the carrier a list of all of their drugs to make sure they get the plan they want. This person could hopefully analyze all of the plans available in their area. By the way, if a person just goes to a carrier, that carrier can only analyze the plan they offer. They cannot analyze all the plans in the state. They’re not allowed to by federal regulation because they’re not licensed with the other carriers. So, the chart outlines the coverage of each of the plans. For the most part, people take Plan D, F, G, or N. It just depends upon what the rates are where they live because every state has different rates, and what the individual would like. There’s much math that goes on here because the person that goes on a supplement plan would generally be paying maybe I would say the average would be $150 a month for a supplement plan. Many states are much higher; they’re more than double that amount. For instance, in New York and Florida, it is costly to have a supplement plan. There are many, many regulations involved here. If a person is turning 65, it’s easy for them to enroll. They can go to either Social Security.gov website or they can go to the Medicare.gov website. It takes about ten minutes to enroll. The Medicare.gov website has a very prominent green button that says, “Apply for Medicare,” and it takes them over to the exact landing page on the Social Security site where they do the enrolling. If you go to the Social Security site, it’s just a little bit harder to find where that page is, so it’s easier to go through the Medicare.gov website. If a person is 65 plus three months after their birthday month, they’re in their “initial enrollment period.” A person would need to go to the Social Security department to enroll. They have a form called a request for employment information that the employer would have to sign, and a reason that the person would want this done is so that they don’t have a penalty for not enrolling in Medicare when they were 65. It’s readily available by searching online, or Social Security would mail it to them. A person can also go to a Social Security office and enroll there. If they’re 65 plus three months, it’s better not to enroll online because you need this form to prove that you had health insurance, so you don’t get a penalty. If a person has a group plan, they could just enroll in Medicare Part A. They don’t need B and C if there are more than 20 employees in the company. The Department of Labor has a regulation that says if there are more than 20 employees, the employer cannot tell a person to enroll in Medicare; they can’t coerce them. If there are less than 20 employees, Medicare pays all the claims first, so it’s incumbent upon the person to enroll in Part A and B of Medicare. If they don’t, then they would be paying as though Medicare were paying the bills. Some group policies where there are less than 20 employees have to state in writing that they’re going to pay the Part B premium is a person is eligible for Part B. If they don’t have that in the policy, then the person needs to enroll in Part A and B of Medicare. They can stay on their company plan if they want to or they can enroll in either one of the Medicare options, the supplement plans or the Advantage Plans. The annual enrollment period is usually October 15th to December 7th. During this time anybody on a Medicare plan can change to a different Medicare plan if they want. Anyone with a prescription plan or a Part D plan would be subject to this annual enrollment period. The supplement plans are not. You can change your supplement plan the 1st of any month, the caveat being you may be underwritten if you’re already on a supplement plan. On October 15th, a person can decide if they want to change their plan up until December 7th, and the coverage would begin on January 1. Here’s a word about Health Savings Accounts (HSAs). If a person has an HSA account right today, they should not enroll in Part A of Medicare if they want to continue to contribute to their HSA account. They can contribute up to their 65th birthday month and then go on Medicare. That’s okay, but if they are past their 65th birthday month and decide they want to go on Part A, they should not do it. It the government finds out (through an audit is the only way they’d find out), the person will have to pay back about six months’ worth of their HSA contributions, plus they’ll be assessed a penalty. So, if the person is over 65 and did not enroll in Part A, Part A is always retroactively effective for six months; this is a Medicare regulation. Nobody knows why it’s there, but it’s there. If a person is 70, they have an HSA, and they know they’re going to retire at a certain point, they should not contribute to their HSA six months before their retirement date. Erin Fisher, is President of Find Medicare Plans, LLC, a national Medicare plan agency based in Stamford, Connecticut. She founded the company ten years ago. FindMedicarePlans.com works nationwide to assist people with getting on Medicare through the Federal government and finding the plan that meets their needs (supplements, Medicare Advantage and Part D), representing twelve carriers. Erin’s 24 years of Medicare sales and management were with United Healthcare, Emblem Health and Oxford Health Plans. Her accounts at these carriers included General Motors, IBM, Marriot, American Airlines, Delta Airlines, Federated Department Stores and the United Nations. Erin is a member of the National Association of Health Underwriters (NAHU); NAHU National Medicare Advisory Group; NAHU Connecticut Board Member, NAHU Leading Producers. Through this organization she has been successful in getting Federal legislation passed to reduce burdensome regulations on Medicare enrollees and is lobbying to effect further changes in Medicare regulations. Erin is also a member of Orion Resources, a non-profit dedicated to seniors, Chapin Hill Advisors, Retirement Resource Center and the Financial Planners Association. 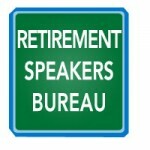 She is the past President of Women in Insurance and Financial Services (WIFS), New York Metro Chapter, WIFS Circle of Excellence member; has received the AARP Community Service Award and many professional achievement awards including those from Senior Market Sales, Aetna and United Healthcare to name a few.